2018 was the year of data scandals, GDPR, data vulnerabilities and companies coming out to announce their data breaches. From a look into EU organizations complying with GDPR to tactics for preventing data breaches, here is a roundup of recently trending data privacy and protection articles. Where the data is being cryptographically processed? How are cryptographic keys being managed? Though the details and complexity of cryptography may seem taxing, it is vital to recognize that an encryption solution provides a stronghold of defense against determined attackers. It is crucial for companies to give both application-level encryption and key management the proper attention. Encryption is the best practice to follow and is the strong authentication, which should be the first line of defense. Robust authentication is the skill to use different cryptographic keys combined with secure hardware (in the possession of the user) to approve that the user is who they claim to be. Having strong authentication as the first line of defense with application-level encryption backing it up, if an attacker manages to slip past network defenses there would be very little opportunity to compromise the sensitive data. No security technology is absolutely unassailable but if implemented correctly, the strong security technologies raise the bar sufficiently high to influence a majority of attackers to go for comparatively easier targets. A lot of organizations have some wrong notions about how to comply with the new data protection and privacy regulation act- GDPR and what would non-compliance cost them. Companies are making some serious oversights that can have some serious implications. Numerous companies are of an opinion that GDPR applies mainly to the customer data, but it is not just limited to that as its protections also apply to their own employee data as well as to the data about their customers’ customers. Here are the top suggestions on how organizations can improve their GDPR program. The Government Technology Agency of Singapore (GovTech) and the Cyber Security Agency of Singapore (CSA) recently announced that they’re partnering with the hacker-powered security platform HackerOne to jointly work with the hackers for government bug bounty initiative. The new bug bounty program is part of the Singapore government’s ongoing commitment to protect its citizens as well as secure government network systems. This hacking challenge will offer a financial reward to the hackers for discovering and reporting potential vulnerabilities. HackerOne is known to help organizations find and fix the potential vulnerabilities beforehand to avoid being exploited by cybercriminals. This hacking platform provider says that it has a wide range of client base, including the U.S. Department of Defense, General Motors, Google, and over 1,200 other organizations. Even after six months of the deadline, merely 29% of EU-based organizations have wholly implemented the EU’s General Data Protection Regulation (GDPR), which leaves them susceptible to major penalties, according to a report from IT Governance. Almost 60% of the 210 firms that were surveyed across EU industries said they were aware of the changes to data subject access requests (DSARs), but merely 29% said they had any plans to adapt their processes for addressing those changes. In terms of security, only 61% of organizations said they have implemented basic rules to address data security and breach management. Although merely 29% of respondents said they considered themselves compliant with GDPR, about 50% said they had procedures in place to notify their supervisory authority in addition to individuals should a breach occur, according to the report. The National Institute of Standards and Technology released the final version of its Risk Management Framework (RMF), that addressed both privacy and security concerns around IT risk management. All federal agencies are required to follow the framework, according to a notice from the Office of Management and Budget. The framework outlines the need for collaboration on assessments and plans for privacy and security, as crucial to authorization decisions. The revised RMF reflects the increasing trend, at NIST and more broadly in both the public and private sectors, toward approaching risk management and risk assessment as an inclusive, enterprise-wide responsibility rather than as a series of distinct activities divided into the subject matter silos. FPF conducted a study of the companies enrolled under the US-EU Privacy Shield program and determined that about 152 European headquartered companies are active Privacy Shield Participants. This number is now more than the 114 EU companies that were active Privacy Shield Participants past year. These European companies depend on the programs to transfer data to their US subsidiaries or to the essential vendors who support their business needs. The European Commission recently published its second annual review of the EU-U.S. Privacy Shield, finding that “the U.S. continues to ensure an adequate level of protection for personal data transferred under the Privacy Shield from the EU to participating companies in the U.S.” The decision advocates a key data transfer agreement to support transatlantic trade and ensure meaningful privacy safeguards for the consumers. It is also good news for EU employees as well as for the companies, many of whom rely on the agreement to retain and pay staff. The Commission’s evaluation illustrated a key next step to support the Privacy Shield arrangement, i.e., urging the U.S. government to appoint a permanent Ombudsperson by the end of February 2019. Moreover, FPF research determined that more than 1,150 companies, almost a third of the total number analyzed, use Privacy Shield to process their own human resources data. Obstructing the flow of HR data between the US and EU would mean delays for EU citizens who receive their paychecks or a decline in global hiring by the US companies. Consequently, employees win when the Privacy Shield is maintained and grows. 8. In 2019, how stringent impact of GDPR will be? GDPR implies a lot of responsibilities on companies about how they handle people’s data. These responsibilities include not using people’s personal data in any manner, without proper authorization or a reason. That can, for example, be a court order, definite consent, or if processing is necessary to execute or prepare a contract with the person, for instance, background check before leasing them an apartment. Companies are also prescribed to have transparent data processing, appropriate data security, and have to notify affected data subject within 72 hours or face penalties. This last obligation is great, but it hasn’t had much impact in 2018 as there’s been a lot of big data breaches, most of which didn’t even notify affected users within the 72-hour period. GDPR’s impact in 2018 can be projected for greater awareness regarding the handling of personal data that encourages companies to change their approach. To do that, better enforcement is required, which will be coming soon. Furthermore, GDPR’s impact will keep growing in 2019, when the legislation’s full capabilities will be realized. Dataguise, a leader in the data privacy and security space for over a decade, is committed bringing you the latest trending stories and articles. 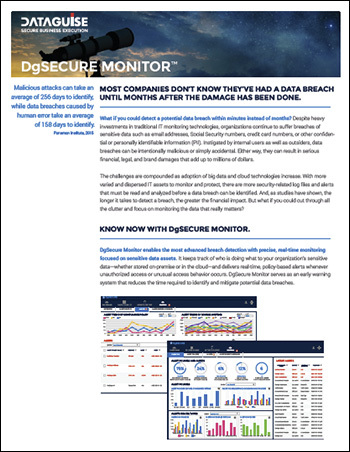 We hope you find our monthly recap useful, and if you’d like to learn more about how Dataguise helps enterprises worldwide locate, identify, protect, and monitor the privacy of their sensitive personal data, contact us any time for more information or to setup a free product demo.